You are here: Home / Celebrity Events / Singer KȆTA Teams Up With LymeLight Foundation & Stageit For Benefit Show! Singer KȆTA Teams Up With LymeLight Foundation & Stageit For Benefit Show! 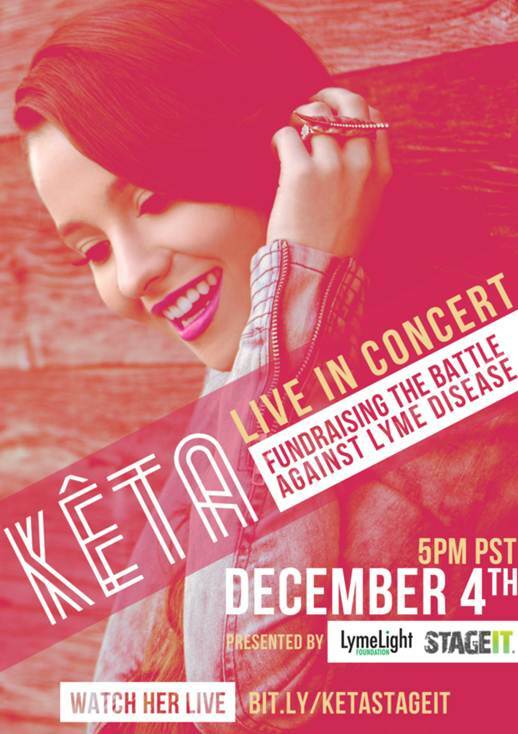 Singer-songwriter KȆTA is teaming with the LymeLight Foundation and Stageit for a special benefit show that will stream live on Thursday, Dec.4th at 5pm PST. The concert will benefit the LymeLight Foundation, an organization that helps children and young adults with Lyme disease to receive proper treatment and medication, as well as raise awareness about the disease. Fans can catch the show on Stageit (www.stageit.com), a live streaming platform that enables artists to deliver and monetize exclusive live performances while allowing fans to tune in and interact anywhere in the world from their mobile device or computer. The December 4th show will see Kȇta performing songs from her new EP, Generation Call, a stunning atmospheric blend of softly curved melodies, lush electronics and honeyed vocals singing irresistible hooks. She’ll also be performing new song “Wooden Horses,” which can be heard here: https://soundcloud.com/ketamusic/wooden-horses. Don’t miss your chance to catch Kȇta live on Stageit December 4th at 5pm PST. « VIDEO: Time To Go Old School With Some A-‘moose’-ing Puns From ‘Rocky & Bullwinkle’!